"Who killed my mom, and why would she have stabbed me?" 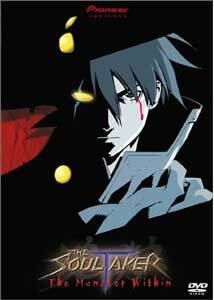 The first volume of The SoulTaker was, for this anime viewer admittedly lacking in patience, a somewhat frustrating affair. I was drawn in by the otherworldly visuals, amazing use of colors and symbolism the likes of which I've never seen in a made-for-TV anime. But I was less than interested in the overly-familiar-yet-incomprehensible storyline, the stock characters, and the banal dialogue. I'm still interested in seeing the next volume, not so much to find out what happens, but to see how it happens. Unfortunately, that's not enough to get me to shell out $25 for the next three episodes.The SoulTaker is shameless with its religious imagery (see the title logo), but it's the weird, otherworldly Japanese view of Western philosophies (namely Catholicism), which seems to grasp little more of the belief system than the cross as iconic symbol. Everything begins in a church. A boy, Kyosuke, is stabbed by his mother, thought dead, and buried. He awakens, mysteriously healed, after being dug out of the grave by Maya, his long-lost sister (but not). It's unclear why, exactly, his mother stabbed him, or even who his mother is. But apparently Maya is a sort of shade of Kyosuke's real sister, and the evil corporation, Kirihara, is searching for both the real girl and these imitations (called Flickers). Kirihara kidnaps Maya, and while attempting to rescue her, Kyosuke discovers he has the power to transform into the awesome mutant, The SoulTaker. Whatever.At least in this first volume, the plot makes little sense. It is unclear exactly who everyone is, and what anything means. What is a Flicker? I don't know, but the characters seem to. Who are the weird mutants also trying to capture Maya? Eh. It doesn't really matter anyway, because the story takes a backseat to the elaborate visuals, far more impressive than the usual anime series (which show their limited budgets with frequent oversimplified frames). Here, every shot is bursting with action and color, rich with imagery, symbolism, and intricate character and creature designs. The animation is also very fluid, with a dynamic camera and good, but infrequent, integration of CG effects.Visuals alone can't hold my attention forever, and if the series doesn't continue to evolve, and at least try to develop characters that are substantive rather than reactive, I'll quickly lose interest. And please, stop ending the episodes with the same old trick that was used in every episode of Power Rangers and Voltron, with the hero transforming and using his superpowers just in time. Because no amount of pretty pictures can make me forgiving the plagiarizing of tired children's cartoon shows. Also, I can't really appreciate the visuals if I gouge out my eyes in frustration. Image Transfer Review: The transfer certainly does justice to the visuals, and then some; this is the best anime transfer I've seen, period. Presented in anamorphic widescreen, SoulTaker benefits from a color palette that shifts from rich, saturated colors, to deep blacks, and the DVD translates these different elements flawlessly, with rich, deep blacks, and unbelievably bright colors that show no sign of bleeding or dullness. Edge enhancement isn't a problem, and I noted no compression artifacts. Simply put, this is one of the best transfers of animation to DVD I've seen, easily the equal to the latest releases from Disney and DreamWorks. Audio Transfer Review: The original Japanese 2.0 DD track is surprisingly dynamic (the English dub features much the same quality, but laughable voice acting). The most striking element is the music, which is spread across the front soundstage and sounds rich and supported. Sound effects are presented with a fair amount of directionality. I noticed none of the problems that plague many anime discs, such as a restricted soundstage or music and effects that sound harsh or tinny. Not equal to the video quality, but certainly acceptable. Extras Review: Extras are pretty sparse. The overall package is pretty slick, with nice, atmospheric menus, removable English subtitles, and decent chaptering, but actual extras are limited to the opening and closing musical pieces minus the credit overlays and a art gallery with 33 conceptual drawings. The Soultaker is shaping up to be, at least, a visually interesting series. Hopefully in later volumes, the characters and plot will catch up with the amazing animation. For now, though, I can only really recommend it to anime fans hungry for some eye candy.